I think it’s safe to say that social media has taken over (almost) everyone's life. Think about it; how many times a day do you open Instagram or Facebook casually just to see what your friends are up to? I know I’m on there at least 20 times a day mindlessly scrolling and brands are smart. they’ve caught on to this behavior. That’s why while you’re scrolling through your friends post you’re likely to see a brand’s pop in there every so often. Typically they’re easy to pass over, but then there are some that really catch your attention. that’s the whole goal, right? But, what if they catch your attention for the wrong reason? Like offending your values or making you feel totally alienated from their brand? Brands, big and small, make mistakes on social media all the time and in today’s age, they are certainly never forgotten. When brands put a wedge between themselves and their followers, you can bet everyone is going to be talking about it. Last week the Yanny/Laurel debate probably took over your social media feed. After listening to this audio clip people began splitting into two teams, those that heard Yanny (my team) and those that heard Laurel. Then the U.S. Air Force came in and really crossed a line. They took a funny internet debate and brought the death of others into the situation. You can have different opinions about the war itself, but to bring this insensitive tweet to the Yanny/Laurel debate did not put the brand in a good light. But the lesson still stands: Be careful about what and how you newsjack. For a sensitive topic like death or even war, you should be wary about how you use humor. On the flip side, Using a playful meme to bring attention to a much more serious matter can come off badly as well. Always make sure that the news stories you try to align yourself with make sense and are on brand. Ever since they updated their layout and upset almost all of their users, Snapchat has been losing popularity. 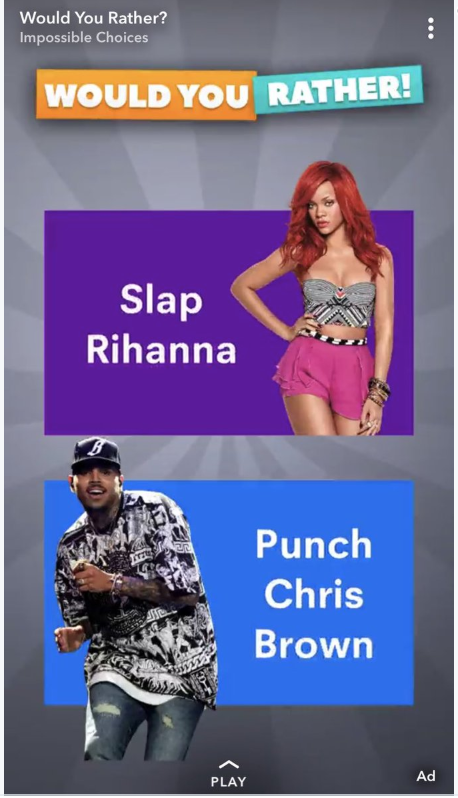 The ad asks users if they’d rather Slap Rihanna or Punch Chris Brown, which directly relates to the domestic abuse case from 2009 where Chris Brown physically assaulted Rihanna. Even with the apology usage of the app is still on the decline and taught us the valuable lesson to be careful of crossing the line between funny and hurtful. 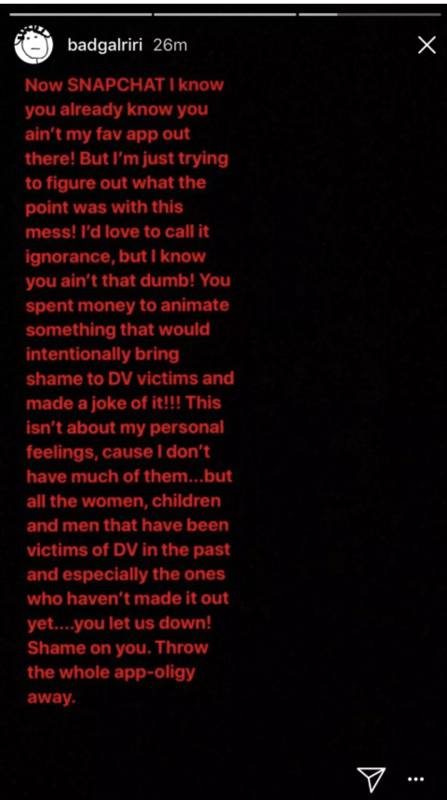 Rihanna is a prominent figure in society and making her look bad and then her not accepting the apology caused even more negative backlash against the app. Again, when you’re referencing a very sensitive subject for most users and making light of serious allegations you’re diminishing others feelings. Normally, Dove is known for empowering women and focusing on natural, realistic standards of beauty. The company has been standing on its Real Beauty platform for over 10 years and, most of the time, it’s proven successful. Take, for example, successful campaigns like “Real Beauty Sketches” and "Evolution" that focus on making women feel proud of the way they look. Unfortunately, in a recent post on Facebook by the company, they’ve taken a ton of steps backward. 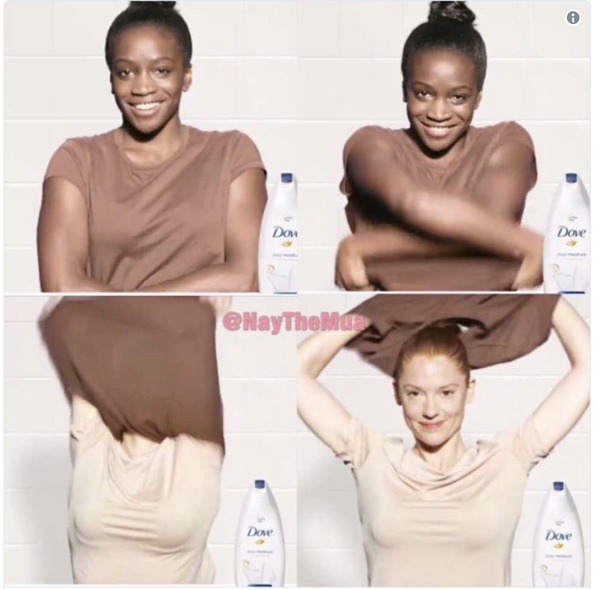 The ad in question shows a black woman transformed into a white woman after using Dove body lotion. This totally goes against their brand message of saying that all beauty is real beauty by showing a woman transforming into an entirely different race after using their product. It doesn’t fit with their overall brand messaging and both alienates and insults a large part of their audience. As we’ve seen with all the other ads, the apology doesn’t do much but the ad does teach us to always review your content through a critical lens. Make sure that it doesn’t offend or in this case, totally go against what your brand represents. 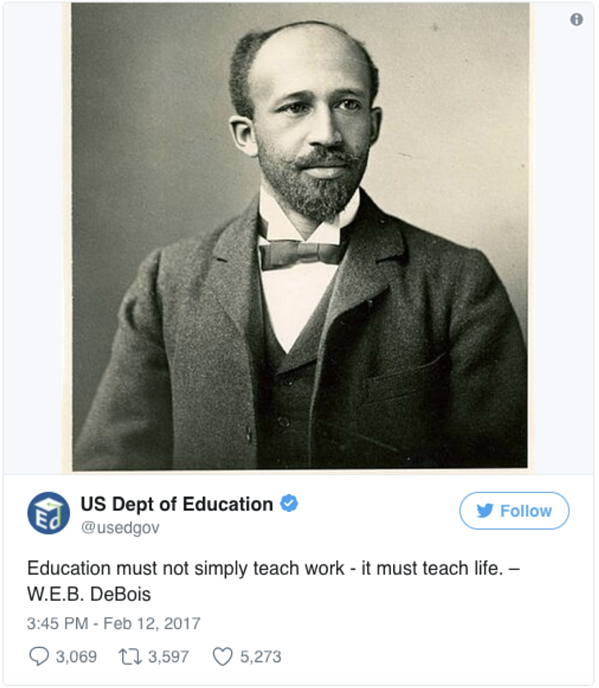 In this social media fail, the Department of Education sent out a tweet to highlight the importance of education. The tweet itself was great, but see if you can spot the issue below. Did you catch it? Whoever sent out the tweet misspelled DuBois as DeBois and Twitter went off! Considering that this was coming from an organization that is supposed to stand for the importance of reading, writing, and arithmetic among other things, this mistake reflected badly on their cause and values. 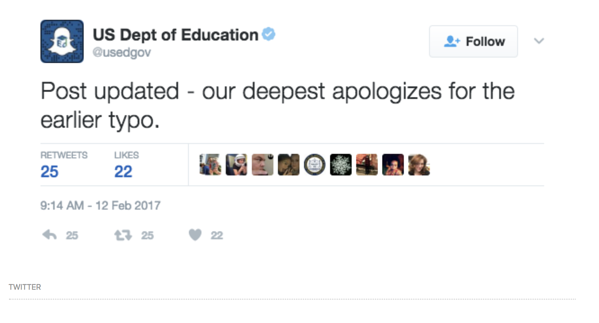 The Department tweeted an apology but again had a spelling error in the tweet causing everyone on Twitter to do a collective Facepalm. The lesson learned here is, be careful of your spelling and grammar Always be sure to double check what you’re posting as it can be seen as not only careless but unprofessional. In this case, the typo even took a jab at the organization’s greater platform. So, always proofread! The New York Times is known for being one of the top newspapers in the world, but that doesn’t mean it’s exempt from some social media fails. 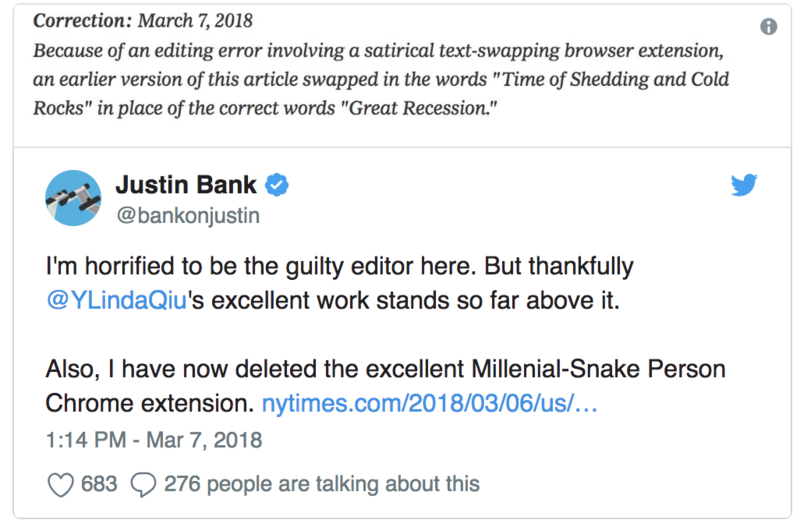 The editor who worked on the article has a browser extension called "Millennials to Snake People,” which changes the word “millennials” to “Snake People,” which means every time the word millennial was referenced in the above article, it was changed to the phrase snake people causing a lot of people to be utterly confused as they read the article. The article with the errors was released exclusively online across the company's social channels making it an easy target for criticism. 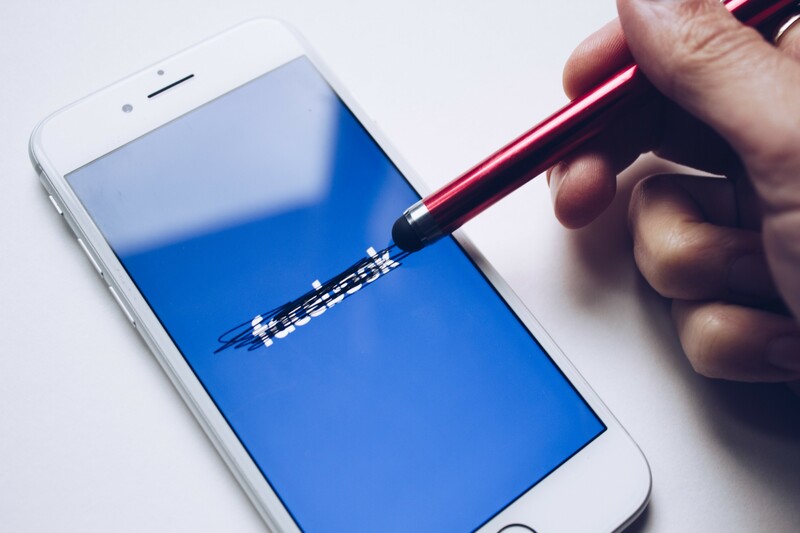 Even big companies that you would expect to have an extreme vetting process in place can fall victim to a social media fail so make sure you learn from their mistakes and double check EVERYTHING. Starbucks has been the center of a couple controversial stories recently, but this campaign is more focused on a less controversial post. 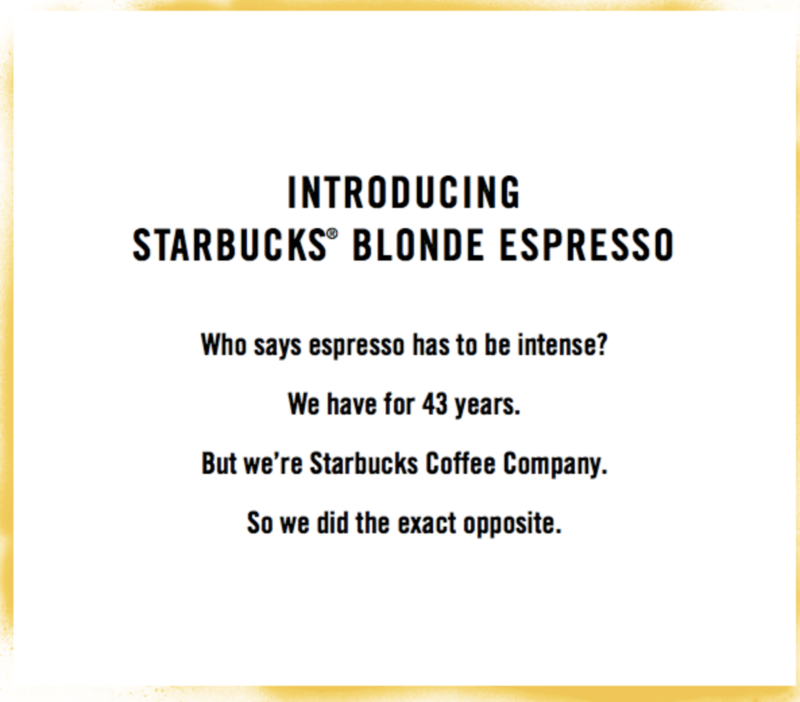 If you entered any Starbucks store late last year, you saw that it was taken over by ads for their new Blonde Espresso. Not only were the stores taken over but their social media accounts as well. I’ve read this post over and over again and it still doesn’t make sense to me. I get the overall point, but the wording is so confusing and the message doesn’t make any sense for the product. I know I’m not alone because this ad was made fun off all over the internet. Starbucks has yet to update their content and when you go their site, this post is still front and center. While they haven’t done anything, learn from their mistake and make sure your ad is clear and effective. Have others outside your company review it before posting to make sure it doesn’t come off like an inside joke or weird riddle. In today’s world, social media can be a highly effective way to increase brand awareness and bring in customers -- but only if it’s used the right way. As you’re creating your social media campaigns, keep these lessons in mind to make sure you’re not offending your audience or crossing the line into being insensitive towards a wider audience. If you’re creating something and you question the content or context of the campaign, bring in a couple other opinions otherwise you may see yourself on our next social media fail list.